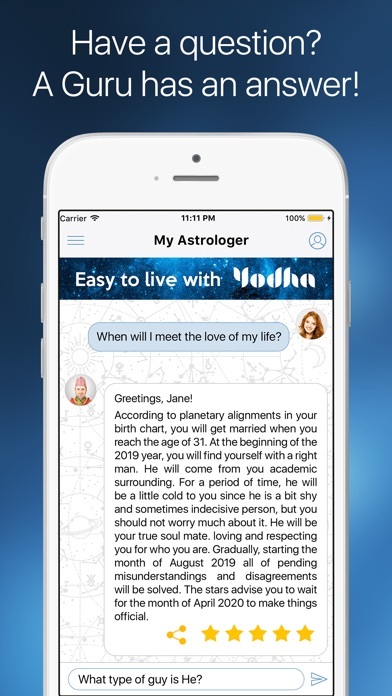 Why settle for an ordinary horoscope when you can have access to authentic Vedic astrologers from Nepal? 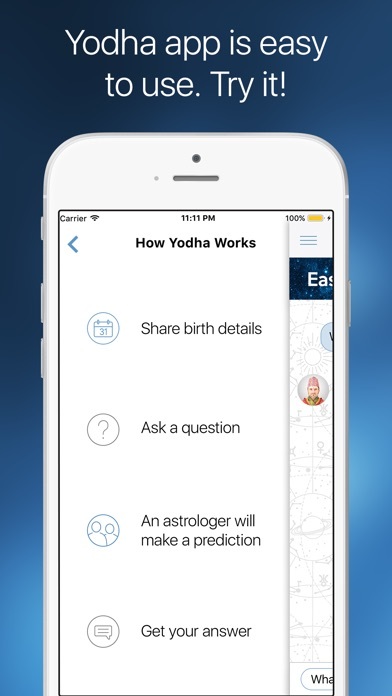 With Yodha app, there are no visits and no calls. Ask real gurus anything you would like to know! With Yodha app, you’ll enjoy: - Immediate access to your personal astrologer on the go, anytime, anywhere - Ease of use - answers to your queries are just a click away - Daily, weekly horoscope updates on special events - Gifts and promotional bonuses - Quality, professional customer care How does Yodha work? 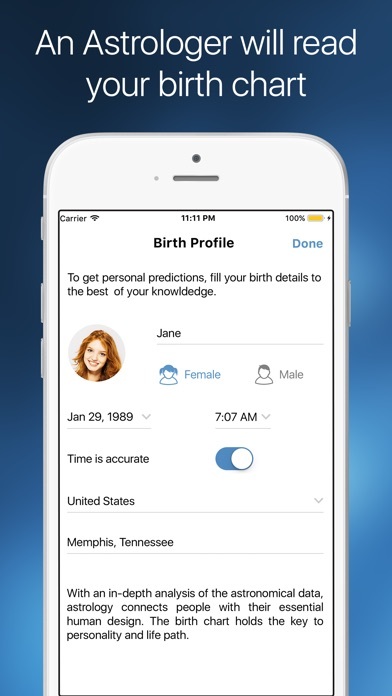 - Create a profile with birth details - Ask a question - An astrologer will read your birth chart and make a prediction - Get your personal reading based on ancient knowledge What to ask? Ongoing changes in the positions of planets and other celestial objects of the universe affect major aspects of your life. Ask what you are interested in to know. Be it about your love, relationship, compatibility… - When and where will I fall in love and get married? - Does the one I love love me back? I want to know my relationship compatibility - Is my Ex love still in love with me? Will my Ex and I get back together? - Is he playing with my heart? What is my love compatibility prediction? Your daily life, activities, and decisions to be made… - What is going to happen in my life today? How should I prepare? - Am I going to pass my math exam test tomorrow? - Should I buy that house in Palo Alto? What is the best place to live according to my birth chart? - Today I am visiting my parents. What's in store for me at this meeting? - How can I plan for the upcoming workday so that it goes as smoothly as possible? The purpose of life, wellness, horoscope and more… - I'm having a hard time figuring out my purpose in life. Do you have an idea of a direction I should go? - What is my Vedic zodiac sign? Because I've heard it is different in Vedic astrology. - Is my horoscope sign always correct about my personality? I act more like a different zodiac sign! Is this normal? - I want to change everything in my life right now. Where should I start? 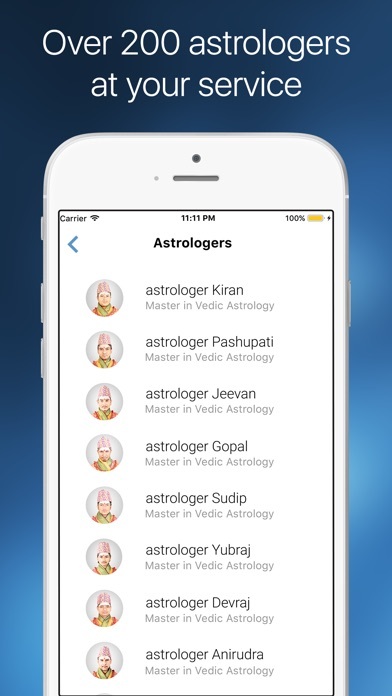 Vedic astrology has been around for centuries and is extremely popular in modern India and Nepal. It is the time-honored, traditional astrological art of ancient culture and has been continually developed and refined since primordial times. It is based upon an in-depth analysis of your birth and astronomical data. Today, Vedic astrology is an integral discipline of study related to medicine and history in many Nepalese and Indian Universities. Vedic comes from the word "Veda", which means "knowledge". The Vedas are the oldest and most significant scriptures in Hindu spirituality, documented by ancient seers called Rishis. The Vedas tap into the mechanics of creation and are daily used in contemplation and deep meditation. Vedic astrology is also called Jyotish, which means "eye (or light) of nature". Vedic astrologers do a deep analysis of person's time cycles related to the zodiac which can help them to predict problems before they arise. Vedic astrology is never fatalistic in nature. It merely warns and suggests positive ways how to avoid problems by making life changes. The ongoing guidance of a Vedic astrologer can be indispensable. Could make u happy or utterly unhappy. Yodha would paint a beautiful picture you would love to know. Interesting things would be told & your head would be over heels. If you’re lucky & readings match with reality then you are set. In case, those things don’t come true then your curiosity would make you ask more. Now, starts the phenomenon of ambiguous answers. You would go in circles until you get tired. Space is very limited & per question is $5.99. Chose wisely. This reading was spot on giving me confidence I was not imagining a situation in my life. I received great comfort from this information and will continue and happily pay their fee in the near future! But you guys need to make a totally free app also like this. My go to for advice!!!! I have been using this app for over a year now. Always have had accurate readings and make me feel at peace with the advice given. The honored their one free question and when my question didn’t provide enough detail they worked around it and gave me a great prediction about my love life! Will be putting money on and useing again! I've been using this app for about a year and the results are astonishing. I'm very happy to say I will be using this app for awhile. It's worth the question price and they do hold specials. Do yourself a favor and use this app. So far, it's been on point for me. Namaste. Update:2019 Pretty spot on! I downloaded this app initially to see if my boyfriend and I would last. I asked the same questions in different ways, hoping for different results, but the astrologers on this app always said we would break up and it would be because one of us felt like we were putting in more than the other, and other such miscommunications. I ignored it, but it was absolutely right, and the breakup happened around the time this app said it would. Coincidence? i think not.